Late 1990s-2006. Mongolia adopts liberal mining regulations to attract investment and ambitious “Gold” program which spurs wave of destruction of country’s most vulnerable natural features – rivers and forests. 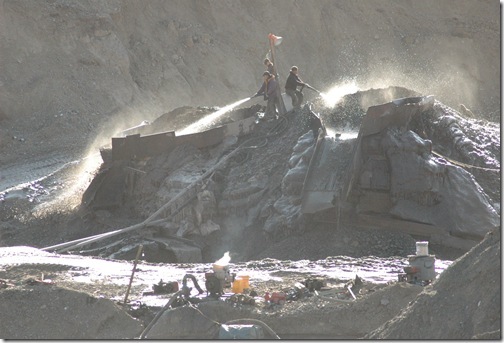 Greatest harm is caused to rivers by placer mining that fully changes riverbeds and creates lasting sources of pollution for hundreds of kilometers downstream. Neighboring Northeast China in 1998 starts successful campaign to close all placer gold mining in river valleys of adjacent forested regions and this progressive policy increases influx of old mining machinery and workforce into adjacent Mongolia and Russia. By 2005 mining and exploration licenses cover approximately 40% of Mongolian territory threatening to disrupt the ecological balance nationwide. Mining causes severe hardships to local herder communities throughout the country, polluting water sources, degrading rangelands, destroying most important river valley refuges for cattle in unfavorable seasons, etc. Nomadic lifestyles are equally threatened by emerging mining camps which challenge traditional land rights, values and beliefs. Many local people undertake efforts to stop destructive activities in their valleys, but most of them fail to prevent threats. Mining companies do not seek consent of local people, but get rights to the land through officials corrupt or not, and then protect their domain with armed guards from any activists’ attempts to stop destruction. Society is full of tremendous mutual distrust between miners, herders, government and civil movements. 2007-2008. Local environmental activist from Onngi River Tsetsegee Munkhbayar receives prestigious Goldman Environmental Prize (perceived as Green Noble Prize) for his work on protecting rivers from mining impacts. http://www.goldmanprize.org/2007/asia Munkhbayar was recognized for having successfully pressured 35 of 37 mining operations working in Mongolia’s Onggi river basin — a precious drinking water supply for rural Mongolians. 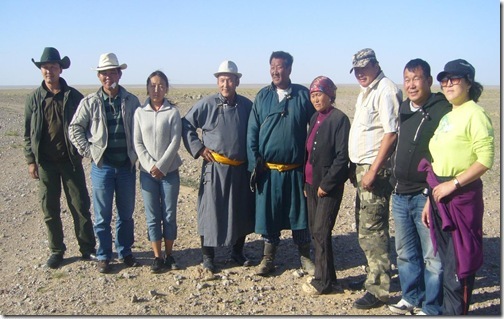 Munkhbayar and several likeminded local leaders from other rivers form Mongolian Nature Protection Coalition (MNPC) to bring their cause to national level. 2009 – The United Movement of Mongolian Rivers and Lakes (UMMRL was formed in June 4, 2009 after its predecessor, the Mongolian Nature Protection Coalition (MNPC), dissolved in the spring of 2008. 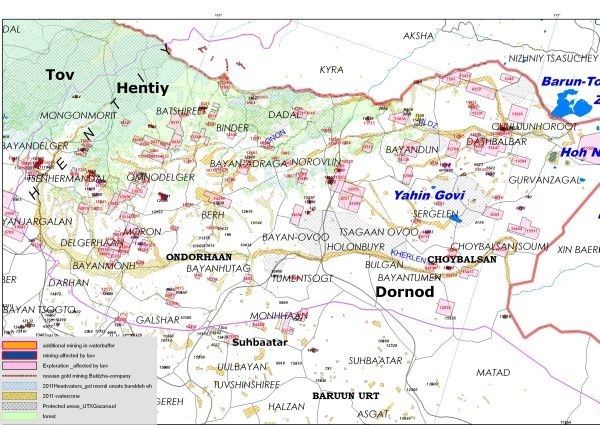 Mukhbayar and his allies convince the Parliament to draft a wonderful piece of legislation “LAW TO PROHIBIT MINERAL EXPLORATION AND MINING OPERATIONS AT HEADWATERS OF RIVERS, PROTECTED ZONES OF WATER RESERVOIRS AND FORESTED AREAS” (Mongolians call it LLN- law with long name) . Legislation aims to set aside most vulnerable areas associated with water sources. Law also aims to reduce conflict between miners and indigenous communities of herders. Parliament procrastinates and law is on the brink of being scrapped, but UMMRL organizes a hunger strike in a tent in front of the Parliament and that triggers law adoption. Protests and conflicts between herder communities and mining companies escalated all summer long, and occurred all over Mongolia. NGO attempts to establish meaningful dialogue with mining interests is noit successful. On a visit to Centerra’s ‘Boroo Mine’ site in June, 2010 Mr. John Kazakov, director of Centerra’s Boroo Gold personally warned UMMRL partners that the mining association and mining corporations were working to pass a new law to neutralize the 2009 law that prohibits mineral exploration at the headwaters of rivers, protected zones or water reservoirs and forested areas. 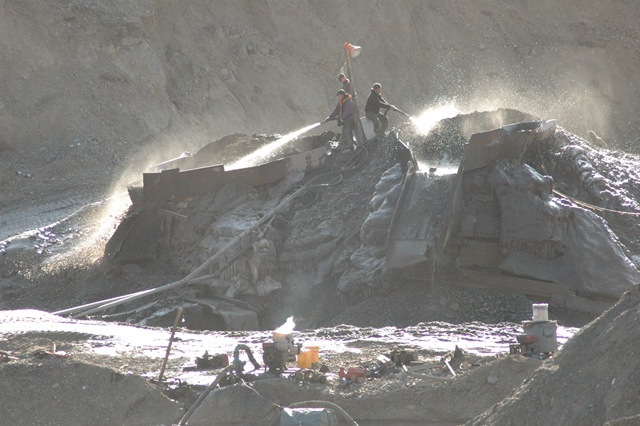 To draw attention to the fact that the Law is not implemented Munkhbayar with friends goes to one of most problematic mining areas and shoots at parked bulldozer (without people) - Two mining sites belong to Chinese Puraam Mining and Canadian Centerra Gold both according to UMMRL have committed crimes specified in Articles 202, 204, 205, 206, 207, 208, 214 of the Mongolian Criminal law. Munkhbayar is summoned to police, investigation started, but he is not arrested. This is followed by several peaceful visits of other local herders to various problematic mining sites and their symbolic “closure” by taking away keys from machinery. UMMRL and Munkhbayar file two law suits for improper execution of the Law and environmental pollution: one against Government and one against mining companies. 2011 May. 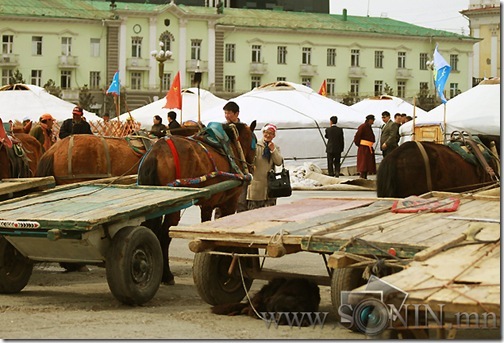 To demand the Law implementation UMMRL organizes famous occupation of the Ulan Baatar Central Square by nomadic camp. (seeWake up, Mongolians! 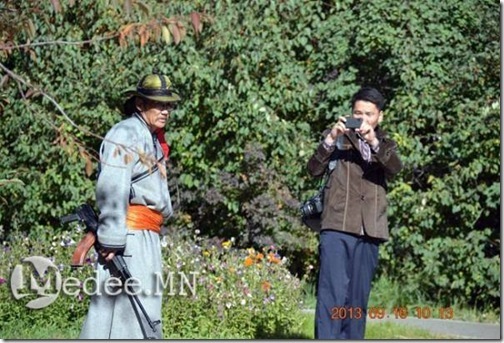 )Event includes symbolic arrow shooting at Parliament building. The problem is that many political forces try to take advantage of this successful campaign and the camp in two weeks is taken over by political parties with very different agendas. Gal Undesten ( “Fire nation”) movement is formed for political action by some UMMRL leaders and 10 small social movements ranging from retired military to car-drivers union. Movements are mostly with strong nationalist agendas. Many UMMRL leaders disagree that UMMRL should play explicit political role and leave the movement ( partly because they are active supporters of other political parties as UMMRL former CEO Duvchingambyn Ganbold from Democratic Party). 2011 June. Munkhbayar with 40-strong nomadic cavalry inspects mines along rivers in Uvurkhangai Province and signs agreements with mine managers that they do not dig earth until the Government resolves the issues associated with the Law. 2011 July/ Munkhbayar and several key May protest organizers are arrested and kept in jail for “unsanctioned demonstration” but released after 30 days partly to international pressure. (see RAID letter to the Mongolian Ministry of Foreign Affairs ) All charges related to anti-mining activities in the field including bulldozer shooting were dropped. 2011 October/ Supreme Court of Mongolia found the Government guilty. 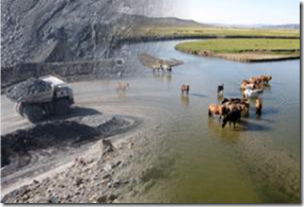 After a year of litigation process UMMRLvsGOM on Fri Oct 21, 2011 Mongolia’s Supreme Court has ordered the government to enforce a ban on mining in river and forest areas. This is actually a solid legal basis to refute nowadays desire of GOM to weaken the law implementation. 2011-2012. 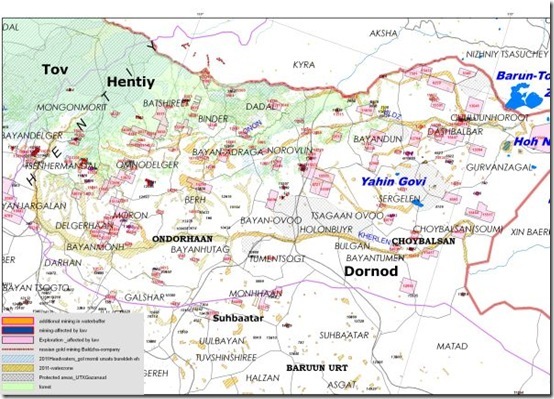 Government starts real implementation of the Law: First batch of licenses is revoked, protection zones delineated, evaluation of environmental damage from mining evaluated, etc. Mining companies come to the Water Service to get a certificate that their licenses lie outside protection zones. The LLN becomes the “greatest achievement of Mongolian government in environmental protection” as reported by Mongolian officials in many international meetings. 2012. Spring-Summer Munkhbayar along with many other environmentalists goes to parliamentary elections and looses as everyone else. Elections are won by Democratic Party heavily infiltrated by mining interests. 2012 Fall/2013 Spring. Government structure is fully reshuffled, as well as core officials. Water Service is abolished. As a result all previously developed mechanisms for the Law implementation are weakened or scrapped. Environmental movement is somewhat marginalized and weakened, new solidified government is much less interested in listening to activist groups. 2013. June-July. “Green” Democratic Party President Elbegdorj is reelected, and that leaves the ruling Democratic Party that holds Parliament, Government and Presidency without any apparent reason to listen to the civil society. Munkhbayar participates in the Rivers of Siberia Conference in Irkutsk and declares that by the fall we may see major anti-environment initiatives by GoM. He looks very concerned by decreasing accountability of the government. In July he migrates to his ancestral land on Onggi River to lead the sea-buckthorn planning project. 2013 August/ Government undertakes several unwise moves that make Mongolia less promising place for foreign investments and investments go down. Gold reserves are running out. Gold miners promise to replenish them if the Law is abolished. Munkhbayar immediately comes back to Ulaanbaatar and with UMMRL leaders spends a month of August in fruitless attempts to meet relevant government officials to discuss the Law amendments. UMMRL prepares to present their own vision how the Law should be implemented in current circumstances. No agency or office agrees to listen to them. An irregular spring session of the State Great Khural (Parliament) is hastily summoned on Sept 16 to discuss amendments to several laws including amendment to the implementation of LLN prepared by the Mining Ministry. 2013 Sept 16 Protest On the morning of September 16, delegates representing 11 non-governmental organizations protested outside the Government Palace against proposed amendments to the Extraction Law on River Basin and Forested Areas. They placed banners with introduction of the LLN on the fence and talked to the public outside of the fence of the Parlianment building. "The demonstrators wanted to take a petition into the parliament house but were stopped by the guards. The demonstrators didn’t shoot on purpose but fired a gun unintentionally," said police captain Yondon Lkhagvasuren, adding that no one was injured. “12:15 p.m. An emergency lockdown the Government Palace ended after two hours and police arrested nine more protesters. The remaining protesters dispersed. 2:00 p.m. Before The staff of the Ministry of Economic Development, Ministry of Population Development and Social Protection, Ministry of Finance, Ministry of Mining, and Ministry of Nature, Environment and Green Development evacuated their buildings under police protection as authorities responded to a report that bombs might have been placed in the ministry offices. 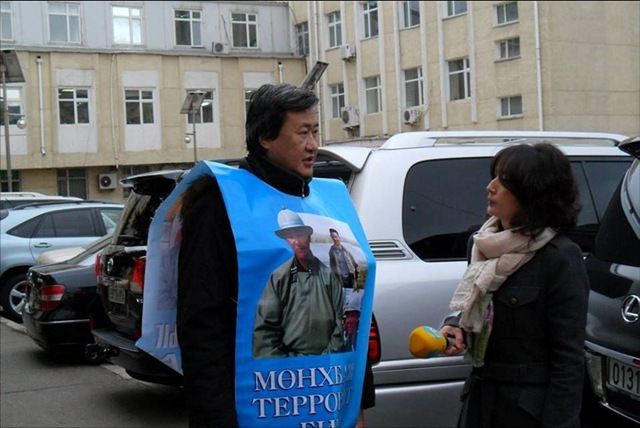 Such exuberant activity of police also can be in part attributed to the fact that that day a new head of Mongolian CIA took office and had to show his fitness and power. There is substantial likelihood bombs were planted by security agencies or third-party interests. 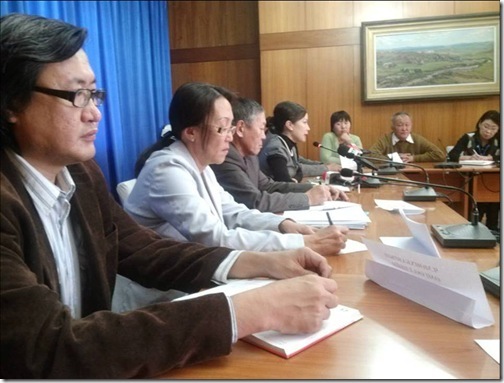 http://ubpost.mongolnews.mn/?p=6184 The civil society organizations of Mongolia at their press conference Sept 16. stated that while they do not support the use of arms, they do blame the government that led to use of arms to get their attention. 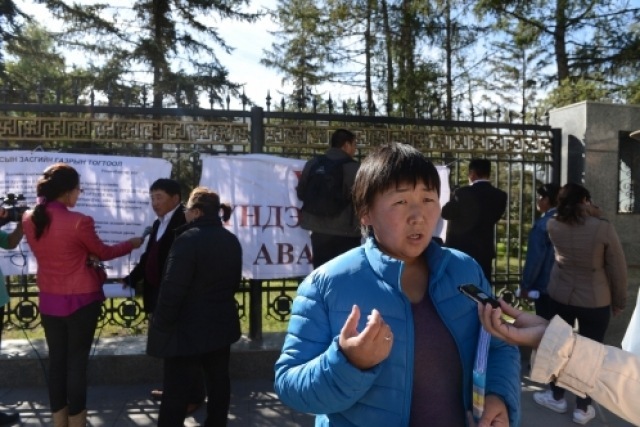 Prime Minister’s senior press-secretary had sent out a text message to media to close all access to pro-Munkhbayar news and step up news and programs criticizing civil society organizations working “against” mining companies. Just after Munkhbayar was arrested the Investigation agency made full scale search in his apartment and that of his children. When his son asked the reason for taking away his father’s Goldman Prize as this was most important property for this family they said “We need to investigate how and by which way he got this prize”. What has Munkhbayar been charged with? Article 177.2 of Criminal law which says 177.2. The same crime committed by a recidivist, an organized group, a criminal organization or if it has entailed human death another grave consequence shall be punishable by imprisonment for a term of more than 20 to 25 years or the death penalty. It is likely already dropped as people arrested just on this allegations have been already released ( like Gantulga –from Onggi Gol Movement who was arrested on Sept 24 as he was packing to go to River Symposium in Australia). Base for this is a contract signed by Onggi Gol Movement and one Mongolian Mining firm about cooperation on monitoring mining impacts on the environment and people. Funny enough most western and many domestic NGOs in Mongolia have explicit MOUs with mining firms on various cooperative activities and we would be amused to see, let us say, Rio Tinto accusing The Nature Conservancy or Flora and Fauna International for racketeering them. C) “unsanctioned demonstration ”-this is continuing reason to harass environmental activists since Sept 16. 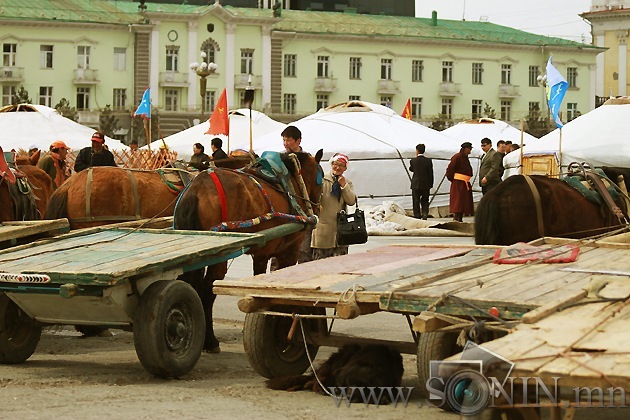 Oct –November 9 2013 The Law is still not changed by the Parliament and there is growing concern in Mongolian society about whether weakening this legislation would do any good for the future of the country. Nevertheless the Minister of Mining D. Gankhuag refused to release to civil society groups a copy of the draft proposal for the change of Implementation law “To prohibit mineral exploration and mining operations at headwaters of rivers, protected zones of water reservoirs and forested areas” submitted by Munkbayar. He also refused to invite UMMRL representatives to working group, since “it already includes representatives from civil society” whose names are not disclosed. The UMMRL and various other movements meet with parliament members, including committee that is preparing proposal how to revise the Law. Every week a “silent protest” is organized at the Ministry of Environment. During the protest the UMMRL coordinator Tserenhand was arrested and fined for alleged violation of “regulations on public rallies”, although she herself practically did not take part in that particular protest. UMMRL representatives went to 2 news agencies to release information. Journalists said to the representatives that they support Munkhbayar very much but they were warned from the top not to produce any news related to Munkhbayar. And they have reason to keep quite, for example, a photographer documenting “silent protest” was quickly fired from his newspaper. It is really hard for civic groups to speak out since Mongolians and foreigners get information through the filter made by the Government. 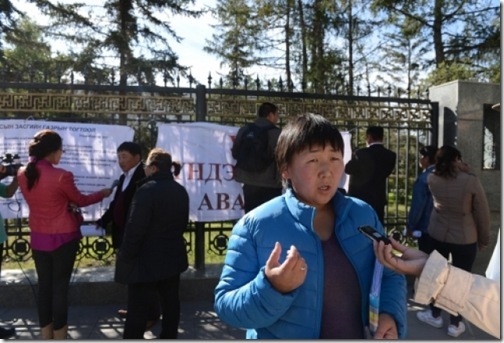 On November 7 Sosnovka Coalition of Environmental and Indigenous Groups of Siberia and Russian Fareast sent to Mongolian authorities a letter in Russian supporting the Law and demanding real justice in Munkhbayar case.